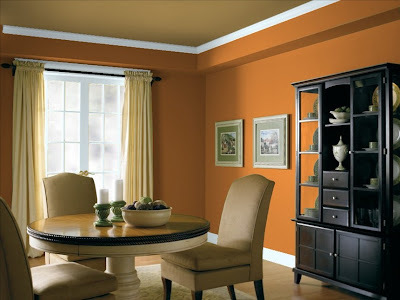 I call it pumpkin spice, my mom calls it terra cotta, Dutch Boy calls it "toasty warm" - at any rate, I took this picture from another blog that was pondering the same idea of an orange room. The den currently has wood panelling and so painting is a must. This could look great with the beeswax color next to it (scroll down to my Sheffeild's post to see our living room color) and would convey the warm welcoming tones we want. With the "pumpkin spice" idea in mind, I've been looking for fabric to coordinate the tones. We'll have the couch of our couch/loveseat set in there and it is a wheat color. We'll have one other chair most likely - maybe my glider rocker from my grandmother or maybe (if he loves me enough) my dad's chair that my grandfather brought back over from Germany. Either way, we'll reupholster. Luckily, neither have too much fabric so it won't cost too much. We've got some other things that need upholstering as well so we'll need to take it a bit at a time. I found this fabric at Sir's Fabric. It is called Regal Rebecca and apparently is a 'folk Jacobean bird tapestry', whatever that is. Eating on the cheap, again.